An epic supernatural horror adventure and the spiritual successor to cult classic Scratches set in a massive, decaying mental institute. Inspired by H. P. Lovecraft, Hammer Films and twisted Euro Horror from the 80s. As soon as we can. Autentifică-te pentru a adăuga acest obiect în lista ta de dorinţe, a te abona la el sau a-l marca drept neinteresant. Este acest joc relevant pentru tine? Autentifică-te pentru a vedea motivele pentru care îți poate plăcea sau nu, totul în funcție de jocuri, prieteni și curatorii pe care îi urmărești. Data lansării: As soon as we can. Disponibil: As soon as we can. Why is ASYLUM taking so long?! Greetings from a dimension of ineffable cosmic hideousness! It’s about time I made this post as some of you keep asking this question, not to mention lighting torches and raising pitchforks. I’ll try to resume as best as possible our vision for ASYLUM, what we’re trying to achieve with the game, and why the darned thing is taking so long. This is a long post, so grab a cup of coffee or beer and enjoy. We’re a very small indie team —essentially three people— operating on a shoestring budget. We tried going with publishers several times but either we found they didn’t share our vision, demanded too much or gave too little. There’s definitely good people out there, but we could never find the right partner for the project. Moreover, the conditions in Argentina, where we live, aren’t always the best. We’re fortunate to have struck a balance between our personal lives and work, but often it’s not that easy. Thanks to the generosity of Kickstarter backers, we were able to finance 50% of the project, the other half being self-funded from our own pocket. It’s very, very hard to finance a large game project, especially one as atypical as ASYLUM. ASYLUM was born out of sheer love of adventure games and horror, as well as the experience with my first project Scratches. It was always meant to be a more ambitious take on the ideas introduced in that game, which miraculously took only three years to develop. ASYLUM is at its heart a classic point-and-click adventure, but feels different. Its ultimate goal is to be a modern and updated take on the traditional adventure game. I’m even tempted to say Interactive Fiction. 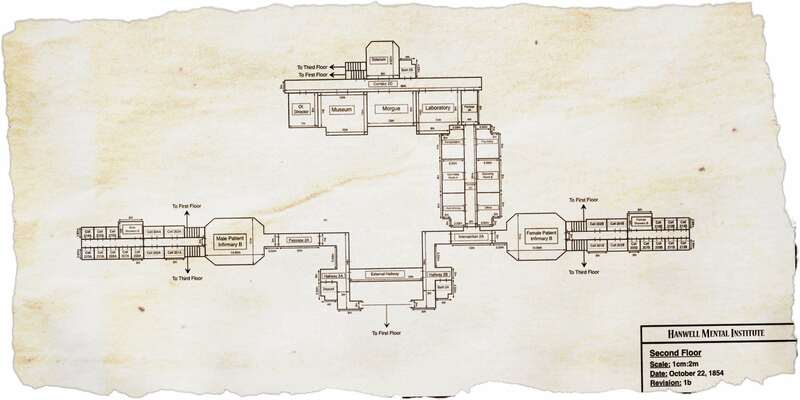 It recently became obvious to me how much companies like Infocom have influenced ASYLUM (and Scratches). 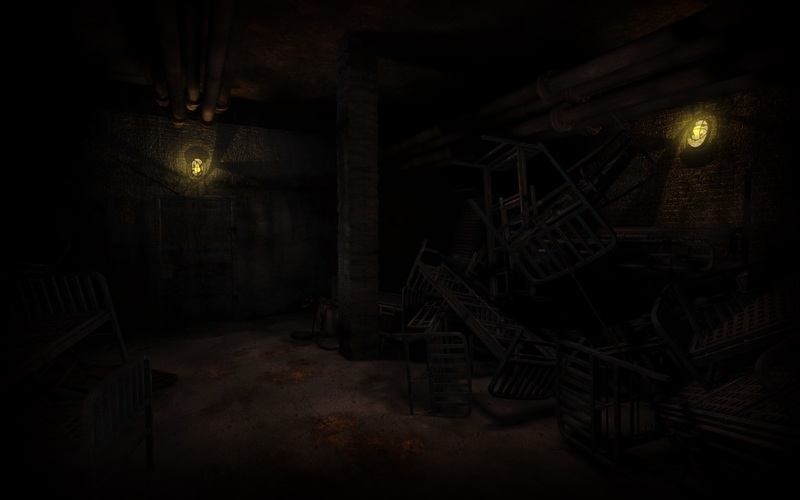 The layout of locations and emphasis on exploration is very similar to your average Infocom game — in fact, the entirety of ASYLUM could be rewritten as an IF game and still work well. AND basements, but enough of these blueprints. Keep in mind that each one of those rooms have a distinct look and feel, as well as tons of little details to discover and cherish, as we don’t want to bore you to death. The whole location has been painstakingly designed and eventually you’ll have full liberty to explore it as you want. It’s huge, intricate, filled with spooky secrets, and we estimate you’ll spend several hours just exploring the whole place. It’s no secret the game is a love letter to adventure games, with a twist. We iterated over the interface several times until we found the right approach and balance. At its core, ASYLUM works essentially like Scratches: it’s node-based with discrete movements. 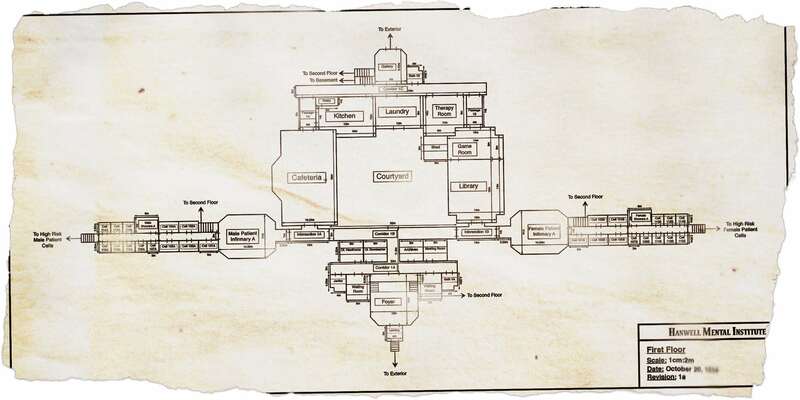 This tried-and-true technique is ideal for adventure games as it allows us to create very detailed graphics for the game, as well as avoid repetition. While the presentation might be somewhat jarring for some players who aren't familiar with classic adventure games, we found that you quickly stop thinking about it after playing for a short bit. Case in point, Serena has been downloaded over 2.000.000 times with close to no friction when it comes to its presentation. Of course, fans of Scratches know the format can work very well. But we aren’t just making a bigger and badder Scratches here — we went one step further by integrating actual 3D elements with these pre-rendered nodes, tweaking stuff as much as possible to make it seem as if you were playing a full 3D game, for instance adding breathe and walking effects. So, imagine that we have these highly detailed rooms modeled with a 3D editor and each node is an actual cube. Fine, then we need to export 6 textures per node. Some rooms have up to 12 nodes. We connect the nodes together, add effects such as fog, dust, sounds… and this is just to move around the atmospheric locations. Interactions are a whole different story. Every single thing you see in the game is a hotspot. Well, you don’t see the hotspot, but it’s there. 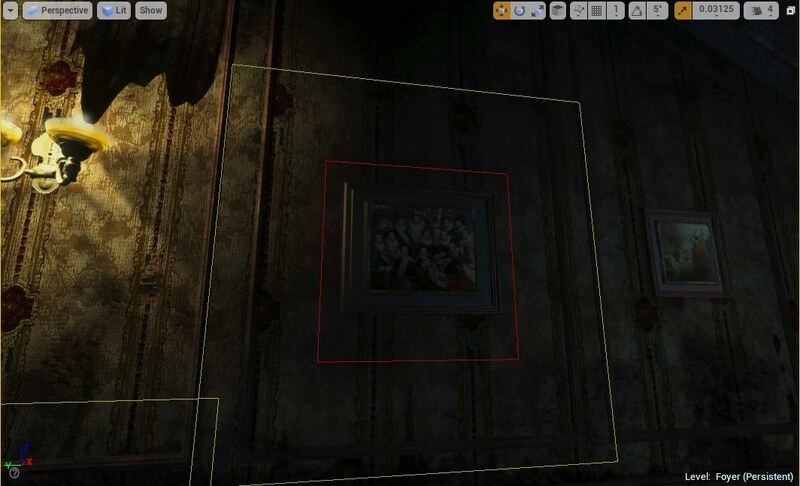 It’s not like we can say “oh hey, when the player clicks on this painting…”, no, we need to manually define the interactive region. This is more straightforward in a 2D adventure game because there are proportionally much less scenes. But consider this: 80 scenes in a 2D adventure are already quite a lot — in pseudo-3D like ASYLUM with an average 4-5 nodes per room, those 80 scenes become 400. And this is in fact the amount of nodes we are estimating have been rendered for the game. Haha, see? See why we’re losing our minds with this project? But wait! You don’t know everything yet. Because I hate repetition in adventure games; I really dislike when you click on a hotspot and get the same canned response over and over again (i.e. : “The ocean looks serene and comforting.”). It especially feels artificial when you click a couple of times to check if the protagonist has something else to say and turns out the feedback is exactly the same. So, we implemented a complex system to avoid that and wrote up to 12 different responses per hotspot. Not just that, but a number of responses are tied to the mood of the protagonist (optimistic, somber, desperate), so some responses will be triggered after certain situations occur in the game. Imagine going back to a room and discovering that the protagonist has a completely different perspective on stuff. That previous line about the ocean turns into “Just as we came from them, one day we’ll all return to the eternal waters”. Cheerful. It’s estimated that just the modeling, texturing and rigging of a character costs $8000 in the industry. That is excluding animations. We have 4 main NPCs here, and 5 minor roles. Considering the animations, the "pro" industry price for our complete cast would have been the entire budget of the game. Games. Are. Expensive. As an indie team we have options, but still, our inability to afford such industry costs resulted in a huge deal of time and headaches creating these characters alone. They may not look AAA, but they more than get the job done and we are happy with the results. 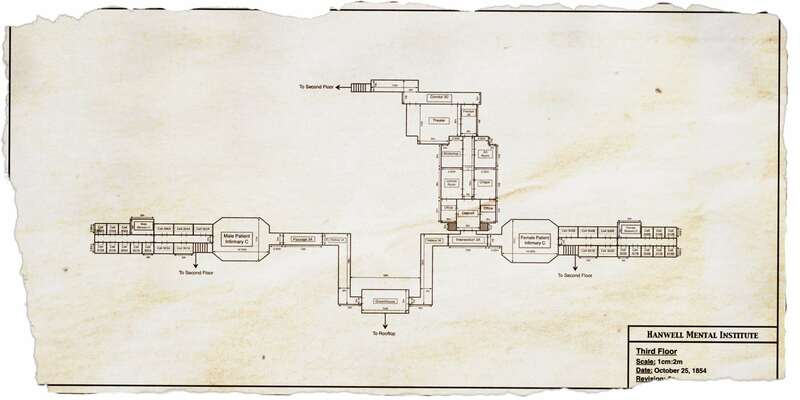 In fact, we estimate that the Hanwell Mental Institute alone, where the game takes place, took us 3-4 years to create, and then another 2-3 years for the characters. There’s many other aspects of course, but location and characters by far took us the most time of development. The final piece of the puzzle is the story. Writing down the script was the first task that was ever done for the game many aeons ago. It’s thorough, twisty, and full of surprises (and we somehow managed to keep it secret for 10 years!). Our undying confidence in it is the reason why we spent so much time and effort working on this project. It’s the ultimate requirement to fulfill that original vision, to ensure the game does justice to the story that was written in the first place. It’s far more ambitious and engrossing than Scratches, which was praised for its story — case in point, Scratches was designed to make sure you never get to see any characters, with conversations always happening over the phone. However, this meant that great part of the plot always felt detached somehow, since there’s this rich array of characters you never see. The story in ASYLUM simply wouldn’t work that way. You need to see these people and even the past inmates through flashbacks. Come think of it, that’s yet another aspect that took us a great deal of time: ASYLUM has countless of cutscenes everywhere with characters and drama, many times more than Scratches… but I’ll stop here. That was merely a general overview. There’s tons of angles behind the development that I’m not discussing here, but hopefully you’ll understand a bit better our position and why this is taking so long. Ultimately, we don’t want to make a passable game but one that surprises you and is never forgotten. Turns out making that sort of game today implies a vast amount of work. But still, we keep making strides and enjoying a great momentum: as the game keeps growing in popularity (27.000 wishlists now! ), we’re eyeing to have a complete playable build (beta) within 2-3 months. The vast majority of assets are ready and we're now focused on implementing puzzles and interactions. As expected, this phase of implementing game logic is comparatively happening much faster than all the previous years of production. To put it into perspective, imagine that we spent 90% preparing stuff and 10% putting everything together. This happens often with adventure games that depend a lot on narrative content and not so much on prototyping, AI, randomly generated content, etc. As for the big question of when it will be ready, we're looking to confirm a release date when we hit the aforementioned beta milestone. However, it does look like we can make it this time and ship the game later this year. For the past several months, we've managed to meet every goal that we set for ourselves. Indeed, things are looking great! Meanwhile, I’ll stick around updating, appreciating your patience, and answering questions. Let there be no doubt that we remain fully committed to this project and making sure it’s released as soon as humanly possible. And I can tell you this: it’s thrilling to finally see the script coming to life, which is working as we hoped, equal shares of horror and mystery that hopefully you won’t ever forget! ASYLUM: Shocking News and Horrific Sights! Greetings, esteemed Steam community! We hope you're off to a terrific 2019! As promised, we come bearing a series of exciting news from the sinister corridors of ASYLUM (and of course eye candy, because we know you love it). STATUS UPDATE... AND POSSIBLE RELEASE! Things are progressing speedy and smoothly, so we feel comfortable to disclose our plans. To recap, since December hundreds of Kickstarter backers have been playing a good chunk of the game with overwhelmingly positive reactions. We can confirm ASYLUM is performing great and no major issues have shown their ugly face. Even better, we seem to have hit a stride, meeting milestone after milestone: we're wrapping up an even larger segment of the game now, and expecting to hit beta around May. And speaking of support, wow... We're now at a whooping 23K wishlists milestone, and it feels 30K may be just around the corner. For now we'll keep working on this lovely basement concealing dark secrets. 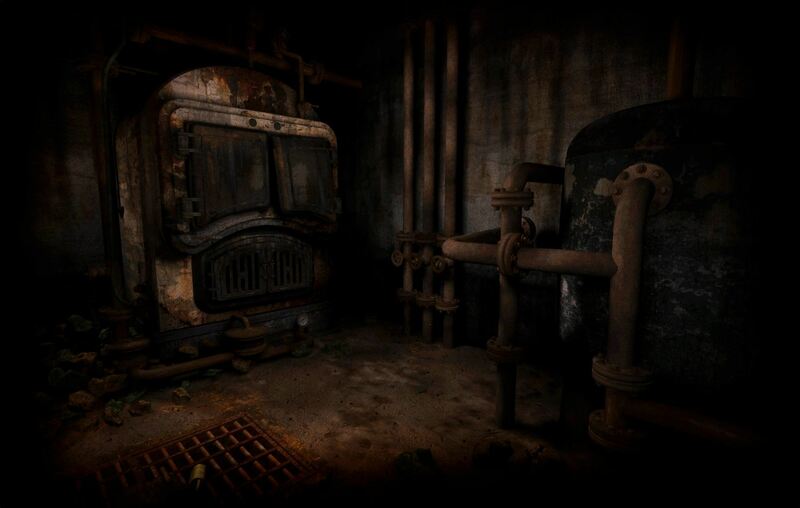 Yes, of course there was going to be basement in the game! Finally, we got access to a fairly pro MOCAP installation in Buenos Aires yesterday and did some tests for the game. If this works out, the amount of work for remaining animations we need to do will be dramatically reduced! It would be quite exciting if we can include this technology in the game. Not that our handmade animations are bad, mind you, but this would certainly make our lives much easier. It's pretty fun, too! THE END... OR IS IT? Of course not, there's lots more coming, but we're concluding this update for now. We hope you enjoyed it, and let us know in the comments if you have any questions. We're thrilled that things are progressing so well, and we honestly can't wait to see you finally playing ASYLUM! From the creators of cult sleeper hit Scratches and the haunting Serena, comes a chilling journey into the darkest depths of your mind. 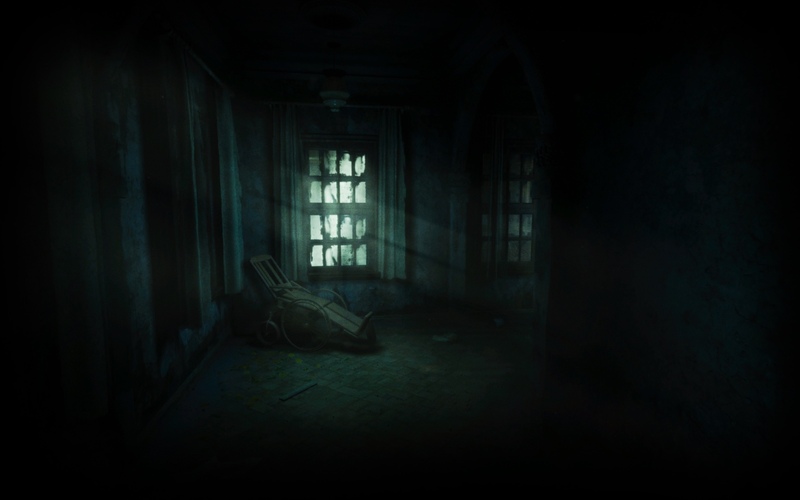 ASYLUM is an ambitious and intricate horror adventure casting you into the hallucinatory setting of the Hanwell Mental Institute, a silent witness to unimaginable atrocities that transpired between its endless corridors. 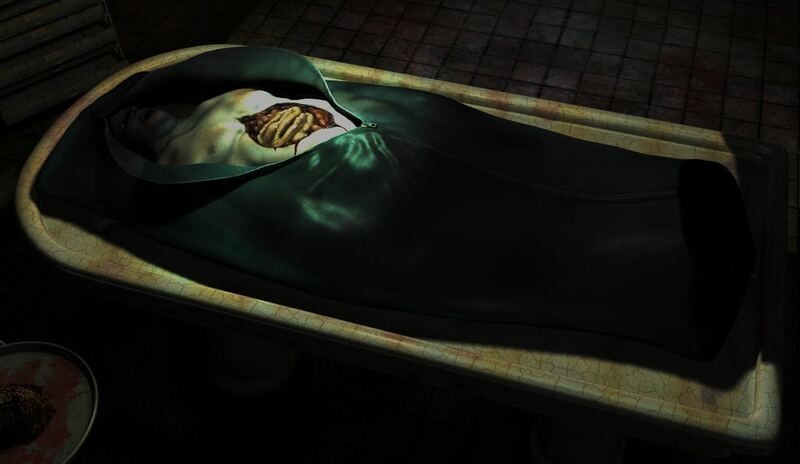 With influences ranging from Lovecraft to Peter Cushing to Lucio Fulci, ASYLUM has been meticulously crafted with a strong focus on storytelling and atmosphere. 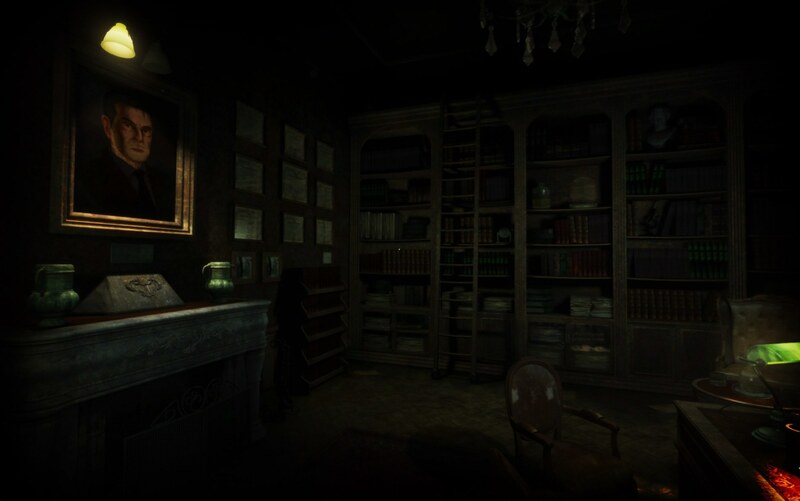 Explore countless tenebrous environments, find your way throughout a towering, lifelike mental hospital, and solve a surreal mystery that will haunt you for years to come. A mind-bending original storyline that we somehow managed to keep secret during 10 years of production. An atmosphere so engrossing you will almost smell the stench of decrepitude and putrefaction around you. Exciting challenges rewarding your wit and observation. No pixel hunting or boring math puzzles. Memorable soundtrack inspired by vintage horror productions and quite a bit of John Carpenter. No jump scares! OK, maybe just a frightening couple that will hit you when you least expect it. Relentless pacing leading to a shocking and disturbing conclusion. You simply won’t believe what’s coming! We poured our heart and soul into creating an involving and endlessly rewarding adventure. If you love the kind of slow-burning horror with an old-school sensibility that creeps upon you, ASYLUM will be an unforgettable experience. Note adiționale: Consider having heart medication nearby. Just in case. 4 curatori au recenzat acest produs. Apasă aici pentru a-i vedea. Poți scrie propria recenzie pentru acest produs pentru a-ți împărtăși experiența cu comunitatea. Folosește zona de deasupra butoanelor pentru achiziție pe această pagină pentru a-ți scrie recenzia. Poți folosi acest widget-maker pentru a genera un cod HTML ce poate fi încorporat în site-ul tău pentru a permite clienților să cumpere ușor acest joc de pe Steam. Autentifică-te pentru a adăuga propriile etichete pentru acest produs. © 2019 Valve Corporation. Toate drepturile rezervate. Toate mărcile înregistrate sunt proprietatea deținătorilor respectivi în SUA și celelalte țări.